• This review is based on the 125 minute International Director's Cut, which is most notable for introducing the character of Jeong-Woo before Park-Yi, and for its non-linear storytelling during the first half of the film. 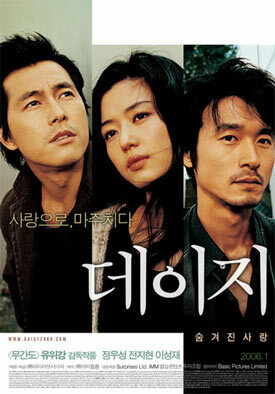 The Korean Theatrical Cut introduces Park-Yi right after the film's title, and is told more conventionally than the Director's Cut. The two versions also have slightly different endings regarding the fates of certain key characters. • The 3-DVD Special Edition of Daisy from Taewon Entertainment contains both the Theatrical and Director's Cut. The Hong Kong Edko DVD contains the Director's Cut only. The Skinny: Gorgeous and ridiculous. A dream Korean cast can't save this two-hour music video from being one of the most disappointing Asian films in recent memory. PanAsia lives with Daisy. This ballyhooed Korean film screams quality from the get-go. Not only does it star the inestimable Sassy Girl herself, Jeon Ji-Hyun, but it's got a story from My Sassy Girl mastermind Kwak Jae-Yong, plus it features a killer duo of actors in Jung Woo-Sung and Lee Sung-Jae. The crossover occurs with Hong Kong director Andrew Lau, who's been on an insane streak since he made the Infernal Affairs series and Initial D. The Amsterdam location and genre-friendly hitman-with-a-heart storyline only intensify any notion of this being a must-see Asian film. Better check those expectations pronto; the actors are fine and the film looks great, but that's as good as it gets. Jeon Ji-Hyun is Hye-Young, a young painter who works at her grandfather's antique shop in Amsterdam, and makes some money on the side sketching portraits for tourists. She ends up falling in love with Jeong-Woo (Lee Sung-Jae), who she mistakenly believes to be the guy who sends her daisies on a weekly basis. Jeong-Woo is actually an Interpol agent specializing in Asian criminals, and not a daisy-delivering romantic, though his growing affection for Hye-Young makes it hard to come clean. Jeong-Woo also must eventually face off against the real daisy guy: Park-Yi (Jung Woo-Sung), a soulful hitman who has pined for Hye-Young ever since he spied her painting daisies in the countryside. Through myriad manufactured circumstances, the two men meet and become rivals over love and the law. Meanwhile, Hye-Young cries in the background, clueless as to who her promised daisy guy really is. If you're looking for good filmmaking, you just might join Hye-Young in her tears. While possessing stunning production values and some fine performances, Daisy goes to hell pretty damn quick thanks to superficial direction, obvious voiceover, and events that are mind-blowing in their sheer stupidity. The film starts promisingly enough. The characters are introduced effectively, and the first action sequence is kinetic and exciting. The actors are charismatic and likable, especially Lee Sung-Jae, who gives his third-wheel cop character both humanity and heart. And the location and cinematography are aces. As a music video - or a tourism commercial for Amsterdam - Daisy is supreme stuff. There may not be a better-looking movie this year. The problem is that's all on the surface. Outwardly, Daisy presents quality, but the interior of the film is startlingly routine and even laughable. First of all, nothing is left to the viewer's imagination. Lau and his screenwriters spell everything out with copious voiceover, such that the film starts to feel like it's being recited rather than told. Also, the film is mind-numblingly serious. Daisy recalls HK flicks like The Killer and Fulltime Killer with its "soulful hitman" clichés, but unlike those films - which possessed dark wit or an enthralling cinematic verve - Daisy possesses absolutely no sense of humor, and its style is exceedingly artificial. Everything is played for such heart-rending emotional effect that you can either submit and buy into the overblown romanticism, or give up and start laughing.